In the last few weeks Microsoft has released Service Pack 3 for both Exchange Server 2000 and Windows 2000 and I have great news. I have installed both of them on my production SBS 2000 System with no problems to report so far. If something should appear I will post a notice on this site immediately. The installations went incredibly smooth and trouble free, and I even did them via pcAnywhere to make sure I could. A number of my clients are not local and I service them remotely. There is also news about a new program at Microsoft if you sell and support SBS for a living. 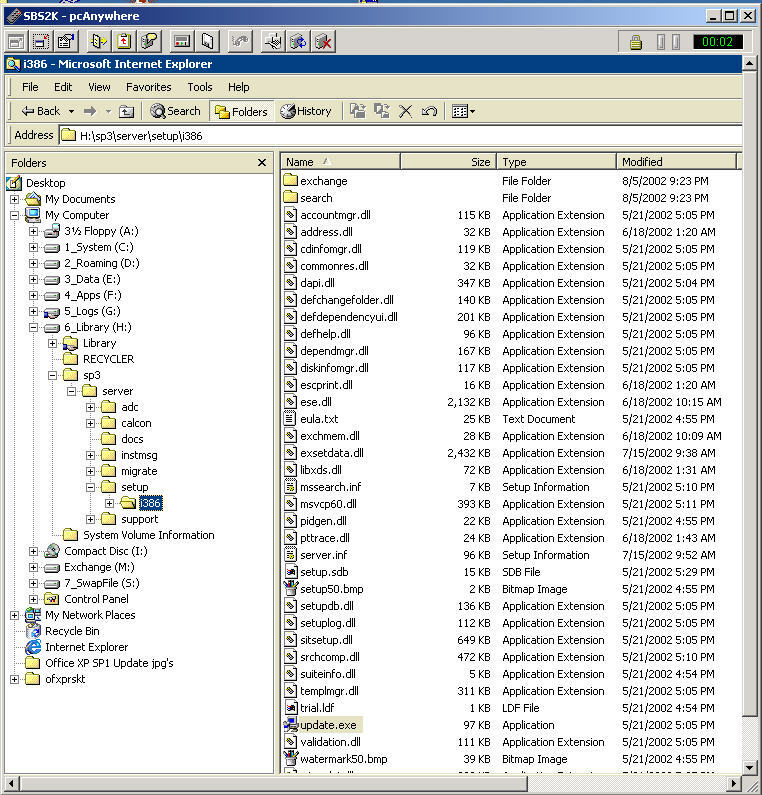 I downloaded the network install of W2K-SP3 from http://www.microsoft.com/Windows2000/downloads/servicepacks/sp3/download.asp as I plan on pushing it out to some of the client machines as part of a review I am working on for Executive Software's Sitekeeper. Of course with SBS 2000 this is not really necessary as you could push it out with a group policy, but there are still folks out there not running Active Directory, hard as that is to believe. You can also get it from the regular windows update site but you have to do that individually. Not counting the download time actual install took 50 minutes from start to the reboot screen, 5 more minutes to the logon screen and another 5 minutes until it had completed the startup process. Your time will of course vary based on the system. This system is a P-4 1.7 Ghz with a gig of ram and dual Raid-5 arrays. On my desktop machine a P-4, 2.2 Ghz with 1/2 a gig of ram and no Raid just 2 U160 SCSI drives the entire SP3 upgrade took about 10 minutes. A couple of things to watch out for! From the time I ran the update.exe until the reboot screen it took 14 minutes, and then the same 5 and 5 which is about the normal reboot time for my system. Now don't forget before you do either of these make sure you have a good verified backup of the entire system. I spent 7.5 hours preparing for this hour and a half of work. If you've ever had one go bad you realize right away all this prep is well worth the time, energy and cost. Also there are a couple of new patches for SQL Server 2000 which you can find at http://www.microsoft.com/technet/treeview/default.asp?url=/technet/security/bulletin/MS02-038.asp and http://www.microsoft.com/technet/treeview/default.asp?url=/technet/security/bulletin/MS02-039.asp although I have not installed them as I don't currently use SQL Server nor do any of my clients. If you sell and support SBS for a living check out the details to this new program here, basically Microsoft is temporarily offering a $500.00 rebate to get you to support SBS. You have to pass an online test to show you have some knowledge specifically about SBS and there are some rules and restrictions but nothing too severe. And if that's not enough motivation they are also putting up a list of the folks who pass the test and register for the program so people looking for SBS support can find you.